The dogs are outside in the yard, like they usually are. The weather is acting like it may start to rain/storm. So, we have everything set up (puppy-proofed) so the dogs can come in when the rain starts. I keep glancing out the windows to check on them because it is thundering in the distance and they hate thunder. Well, I'm looking out the front door window, and Maggie May a.k.a. 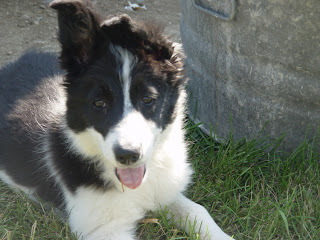 Puppy-Doodles is intently staring at something in the grass in front of her. She's doing the stare... tilt head to the side with those giant gangly ears standing up... nip at the ground... start this routine over again. So, I went out to see what had her attention. Well Miss Doodles had found herself a giant Cicada, and she had put it in the grass in front of her, I'm assuming for entertainment sake. Well, this Cicada is doing the 'rattling-chirpy thing' that Cicadas do - Probably screaming for all it's Cicada buddies to come swarm this big furry thing that is tormenting it. Well, because as she's running through the yard avoiding me - the damn Cicada is in her mouth buzzing/rattling/chirping away! Puppy is running from me, staring at me with that "You can't have it" look and meanwhile - her mouth is rattling like a cell phone that's on vibrate! Then... to make matters worse... as she's avoiding me, she doesn't notice that her big brother Tag decided to sneak up on her to see what was so exciting (Tag always has to ruin the fun). Puppy-Doodles turns and sees that Tag is right there, freaks out that her brother might steal her new treasure... so... what's Doodles do??? She chomps it. The rattling/buzzing was silenced and Puppy proceeded to eat the giant insect - while I proceeded to be major grossed out! AWW, that poor cidada was a product of circumstance there. The dog wanted a new friend, and rather than give it up, your dog ate it! That is too funny. Mmm protein! Nice move Maggie MAy! ewwww, gross!!! My dog did that with a dead sparrow once. The only way I could get it out of her mouth was to toss a dog treat in a different direction. She had to drop the bird to eat the treat. OMG--this is hilarious! Gizmo (one of my Shiba Inus) once thought it would be fun to catch a wasp. Needless to say he learned that was NOT fun. Oh, ick...but funny! I'm sorry, but it is! This is funny. You should of had a video camera. You would have won a fortune! 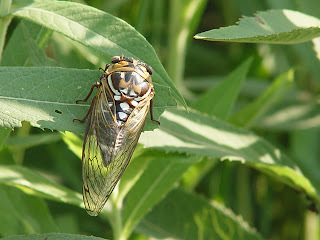 Cicadas are actually good to eat and healthy for you. I wouldn't eat one though. Naughty Little Boy Dog ate a gecko yesterday. Yuk.